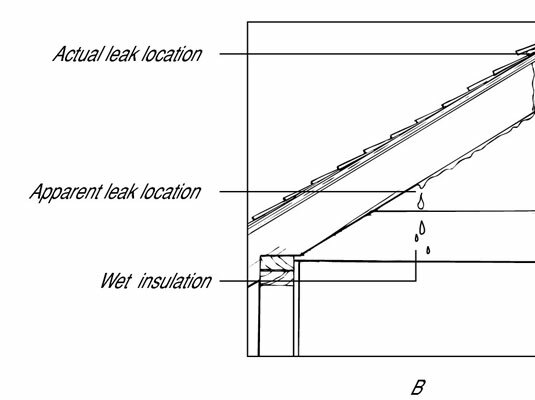 How to find a leak in a roof may be the hardest part of fixing a leaky roof. Finding the actual spot where the roof leaks is difficult because water can enter the roof in one place and run down to another before it starts soaking into the ceiling. 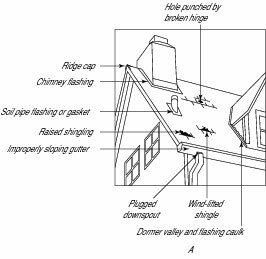 You know the roof is bad if shingles are missing or obviously damaged, or when water stains the ceiling or walls. The goal is to find the leak before the entire roof goes bad. If you have an attic, the easiest way to spot the leak is to up there on a rainy day. Water will reflect light, so bring a flashlight along. Once you locate the source of the water, mark the area. On a nice day, have a helper tap on the mark while you’re on the roof. After you pinpoint the location on the exterior of the roof, apply roofing cement or new shingles as needed. Boots, the rubber seals that are around the electric service and plumbing vent pipes, air vents, and exhaust fan flashing. Looking for roof leaks on the outside of your house. If you don’t want to wait for rain to look for the leak, try bringing the garden hose up on the roof. Run the water over the place where you think the leak might be located. Don’t go crazy with the water; be sure to start small. Have a helper stationed in the attic with a flashlight looking for moisture. The water will reflect the light and make it easier to see.